Is it cold enough for you lately? Have you received some snow by now? Are you bundling up in front of a warm and cozy fire just like we are in my neck of the woods? If so, then you’re needing some rib-sticking comfort food. 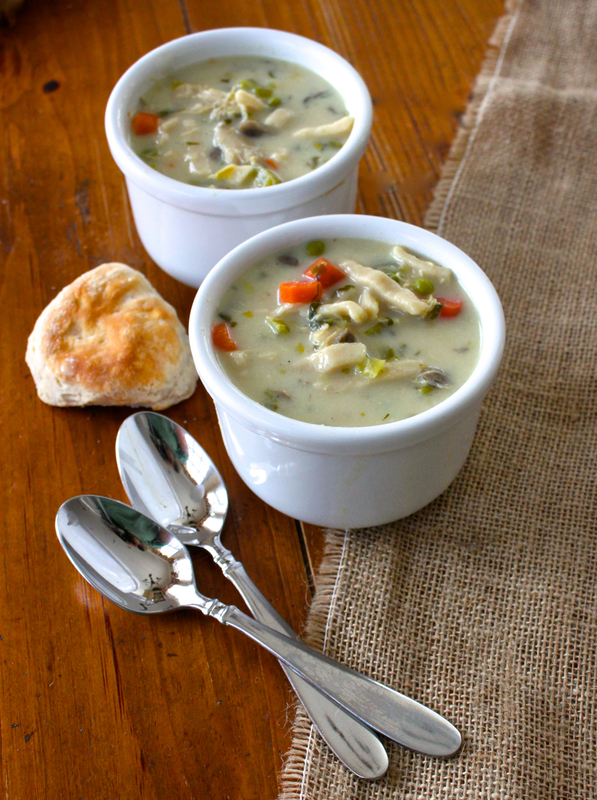 And nothing can satisfy the soul during these chilly wintery days than good old-fashioned chicken soup! Here’s a super easy-peasy Homemade Creamy Chicken Noodle Soup that will have you eating it straight out of the pot! Comfort food just doesn’t get any better than this. And if you’re not chilled to the bone like most of us are during winter, you’ll STILL love this fantastic soup! This chunky soup is totally hearty and chock-full of chicken, vegetables, and thick egg noodles. So good for the soul to help you feel all warm inside! We like creamy soups just as much as broth-y soups, and this soup can be prepared with or without milk, whichever you prefer . . . both have tremendous flavor! One of the tricks to making homemade soup is to make and freeze chicken broth ahead of time. With that done, all you have to do is take the broth out of the freezer to thaw, pour it into a tall pot, add the ingredients, and cook for no more than half an hour. Here’s the link to my recipe for chicken broth –> Homemade Chicken Broth. A second tip: when you make your own chicken broth, chop up the chicken that you used to make the broth and freeze it as well! Thaw it out while you’re thawing out the broth or just throw it in the pot and it will thaw out in the hot soup. You’re ready to go! You can also purchase an inexpensive baked chicken in most grocery stores too. Easy, delicious and healthy! Minimal fat is consumed in this soup, that is unless you devour the entire pot of soup that you will be tempted to do! I’ve also shared a few photos below of what the Carolina’s experienced after this unusual winter snowstorm. It sure was beautiful though! ENJOY and stay warm and safe! This soup is chock full of noodles, chicken, and veggies! Heat the chicken broth on low to medium heat. Saute’ mushrooms in the butter. While mushrooms are sautéing, add the diced chicken to the chicken broth. Add the carrots, celery, Italian parsley. Add the mushrooms after sautéing. Add the sage, thyme, bouillon, and pepper. In a container with lid, mix 1 cup milk with ½ cup flour; tightly attach the lid and shake thoroughly. Add this milk/flour mixture to the pot. Add the rest of the milk (use more milk if you like it less thick). Cook for 15 minutes on medium high until the noodles are cooked to your texture preference (we like our noodles with a little ‘bite’ to them, ‘al dente’). Our “Maui” tredging through snow that he’d never experienced before! 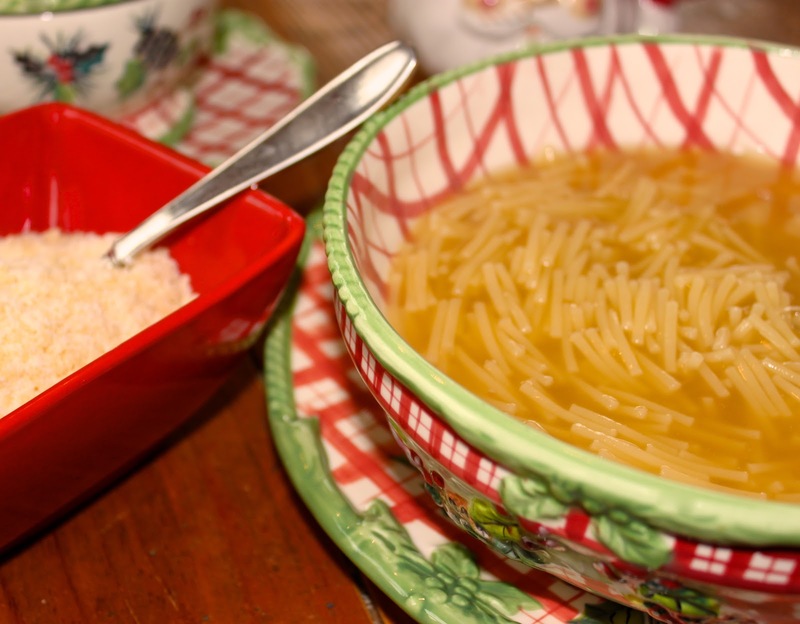 Here are some more delicious soup recipes to keep your bones warm! 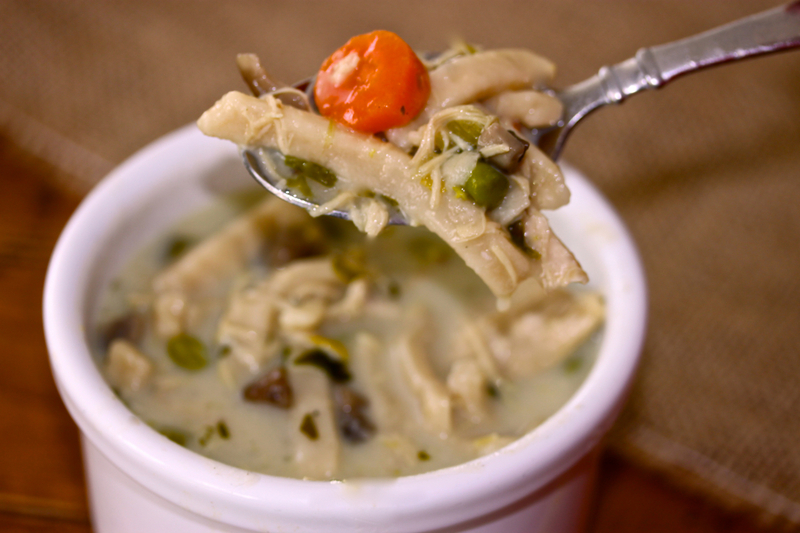 Italian Chicken Soup – Pastina ! Yummy looking soups! It certainly has been the weather for comfort food, almost everywhere on this continent. The soup looks scrumptious and comforting. Thank you so much Angie for your compliment; I just wish my shutter shots were half as beautiful as yours! Cue the locust. You’ve had quite the February. And I can’t think of anything better than this wonderful soup. One of my favorites. Your photos are beautiful and love that Mowee. Orange Tabby cats are just the best. Sorry so late in replying to your comment Lea Ann! Going all the way back to any that I have not returned . . . as you can see, I’m really behind. And yes, I agree! Orange Tabbies are the best! PS – we had bridges and school closings last week, it was very unusual! Thanks so much for your kind comment you guys! You’re the best! I’ll be right over! This soup looks delicious. 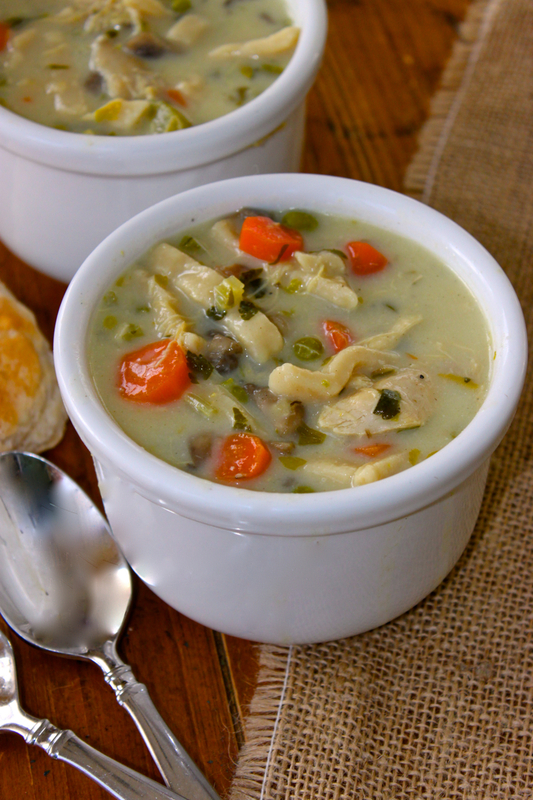 We never had a good homemade chicken soup recipe, so I pinned yours. We’re a little more adapted to snow up here in the northern NYC suburbs but we’re way tired of it this year. 10 to 20 inches were predicted but when I got up and out, the snow was above my knees – that’s more than 20 inches. I spent 9 hours clearing snow with a machine on Friday. We had gotten a foot the week before, so the snow reaches up to the top of the table on the deck. Hopefully, after your hard winter, you’re having a really nice summer Annamaria . . . so very hot here right now! Oh my Roz, this looks absolutely delicious! I may be tiring of snow [though your photos are spectacular! ], but never soup! Thanks Nancy for your visit and comment about my chicken soup! I really appreciate it! This looks so creamy and delicious, Roz! I love a hearthy soup. The east coast has really had a winter for the records books this year. Hope there will be no more earthqaukes. Now that is summer, Pat, I am sure that Colorado is blooming with mountain beauty! Thanks for your visit in February and your kind thoughts. What a wonderful collection of soups! And I love teh snow shots! It is all so beautiful! Thanks Adri. Looking forward to some new recipe posts from you soon! Che belle zuppe , un vero comfort food nel freddo periodo invernale . Bellissime le foto. Un abbraccio Daniela. Grazie bella Daniela! Come sta oggi? Oh the soup looks scrumptious and the snow photos are beautiful. 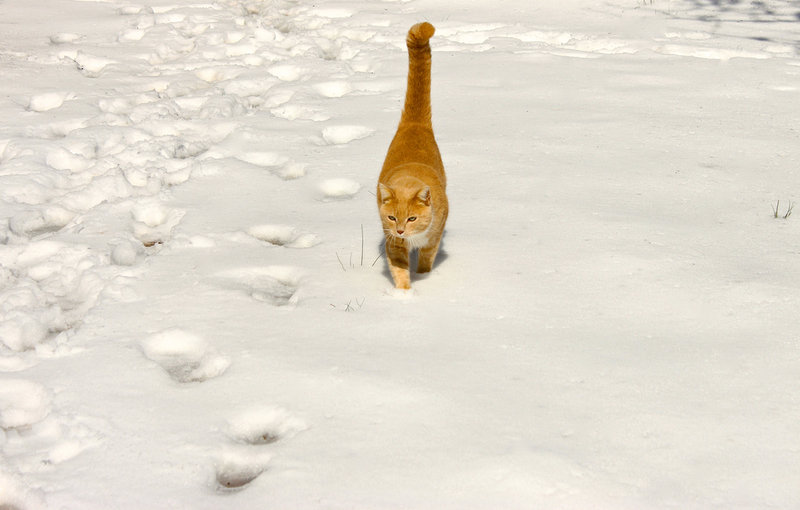 I really love the cat trekking through the snow. thank you Linda; sorry it’s taken me so long to get back to you on this comment that you left in February . . . I’m going back through my posts to see that I replied to each one and somehow I missed yours. I am very happy to find your homemade chicken stock recipe. I haven’t made my own before, but have been wanting to try it. I bet it makes all the difference in a soup recipe. Your creamy chicken noodle soup looks so comforting. I think my favorite part of this post, though, was the pictures of the snow. Oh my, so beautiful! I feel like I got to experience winter vicariously through you. Thank you, Roz! Hi Shari, I realize that it is late in replying to this comment as I am going back to see if I’ve replied to everyone and somehow I missed this comment from you! 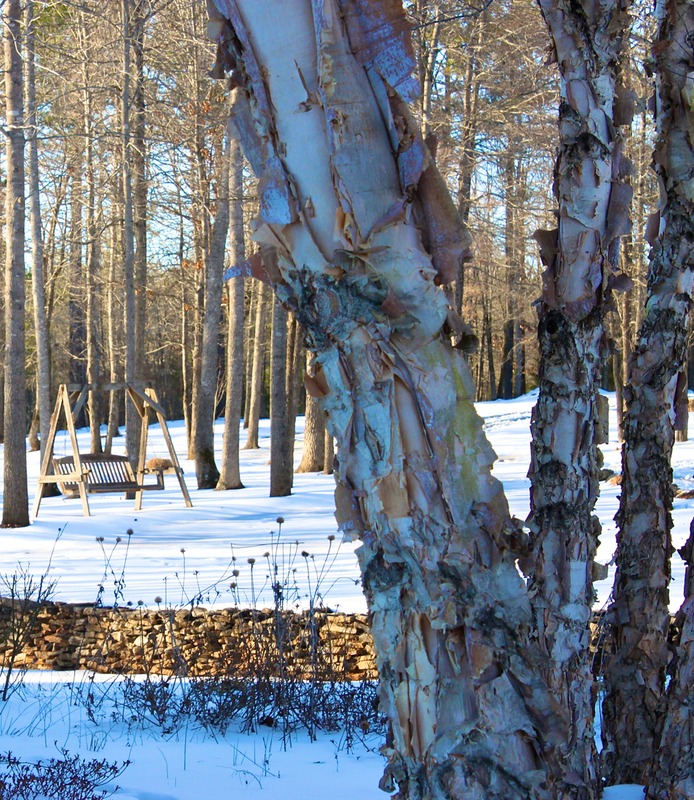 I’m glad that you enjoyed living vicariously through this winter snow post! I’d have taken a day in Phoenix over snow any day, being a warm weather person myself! It looks delicious and my husband would love love love it if I made it. Sadly, chicken soup is one soup all of my family loves, and for some reason I can’t handle it, never liked it. But, this is the chicken soup recipe I want to try, like that it contains mushrooms and peas. Thanks for recipe, Roz and take care! Thanks Pam! I think each of us has some flavors that we don’t enjoy. My mother was crazy about pea soup as well as ham and bean soup and I could never develop a liking for either! oh sweet friend, I want to dive . Soup is such a wonderful and healthy comfort food. I love the photo of your cat in the snow. Our Izzy will be getting his hair cut on Saturday. poor sweet boy comes inside covered in snow balls. Hugs! I make so many finger typos too! I’ve been enjoying so many cherished soup recipes lately . . . healthy and comforting and delicious! That soup sure would be welcome here in Princeton, NJ. I love all your photos, especially the one of the cat. You have great eye and wonderful talent. Grazie mille Linda. I’m truly an amateur and just try my best with the camera. I have so much more to learn! Stay warm! M.J., somehow photos of cats area always favorites; must be the interestingness of cats themselves! We’ve been enjoying a lot of soups lately since we’ve had so much cold weather. Stay warm! OH MY , first your soup is scrumptious looking and its making us hungry- even though its still morning. And your photos are SO beautiful! 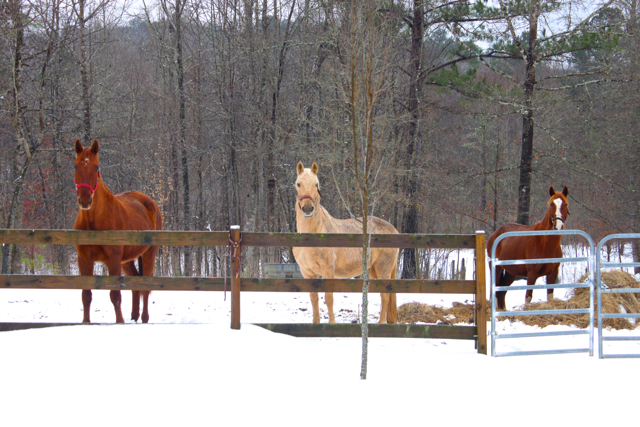 LOVE to see your beautiful horses and your amazing property! 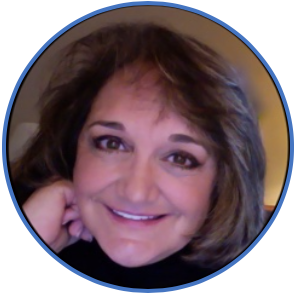 and you still find time to blog- You inspire us Roz! !